The word completion feature can be helpful when you start typing a word and can’t remember the exact spelling. To use the word completion feature, start typing a word and press the Escape (ESC) key on your keyboard. This will open up a list of suggestions for the currently selected word in your document. 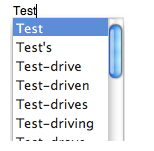 You can then choose an option from the list and Mac OS X will complete the word for you. This feature works in TextEdit and any of the iWork programs (Keynote, Numbers and Pages).